There’s quite a multitude of rowing machines under the Stamina name, models more or less inclusive, falling into different ranges of price. 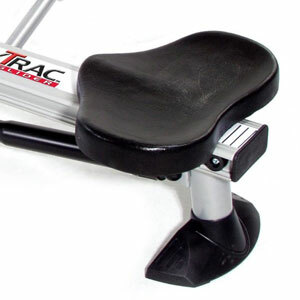 But if you’re looking for an inexpensive rowing machine, which also features a sturdy frame, and a rowing feel as close as it gets to the natural rowing of a boat, the Stamina Body Trac Glider 1050 should be one to look at. This particular rowing machine stands out due to the fact that it offers natural oar-like action, which many users would take over the standard pulling T-bar that comes with most air or water rowers. On top of that, it’s a machine with a low profile, easy to store and costs less than $120. 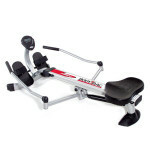 To begin with, the Stamina Body Track 1050 rower combines steel with aluminum parts within its construction. The bases, arms, pivot connector and console tube are made of steel, while the gliding rail is aluminum made. The frame also incorporates several plastic parts, such as the rear stabilizer, the securing caps of the machine’s arm joints, seat stoppers and footrests. The steel parts are painted with silver, anti-corrosive paint, while the aluminum seat rail is not painted, as aluminum is corrosive resistant itself. Overall, the machine doesn’t have a large footprint, compared with a long air or magnetic rower, such as the Stamina Avari Magnetic Rower, or the Sole SR500. It only takes cca 58.2″L x 42.5″W (148 x 108 cm) of floor space, which makes it ideal for use in a small room. On top of that, the frame is foldable. The machine’s arms fold under the rail, which cuts a lot from its width and height. When folded, the machine remains at height given by the console, which is cca 10″ (25.4 cm) while its width is around 23″ (58.4 cm). Evidently, length remains the same, but these being said, you can store it under a bed, if there is more than 10″ clearance under it. However, the folded machine is meant to be stored vertically, resting on the meter bar and the front base. The gliding rail length can accommodate users between 4’11” and 6’2″ (150 – 188 cm). Taller users than 6’2″ may not benefit from a full leg extension, depending on their inseam length, while shorter users than 4’11” may not have a leg span sufficient to complete the rowing motion correctly. In other words, this is a rather small rower, with a limited range of motion. The seat supplied with this rowing machine is quite spacious, 14.5″ (36.8 cm) wide, and 9.5″ (24.1 cm) long. It’s a contoured seat, padded with synthetic leather, but it does not feature any cushioning. In other words, it’s a rather hard seat. The seat glides on ball-bearing rollers, offering quite a smooth glide, for users up to 220 lbs (100 kg). Even though the machine is rated for up to 250 lbs of user weight, a user heavier than 220-225 lbs (100-102 kg), will experience a slightly less smoother glide of the seat, and the wear and tear of the rollers will be higher. The arms of the rower are made of two parts each, attached to the rail and resistance cylinder in a manner to simulate the rowing of a real boat. The superior parts of the arms are pivoting, and can be rotated independently. This adds a bit of flexibility to the rowing motion, rather than the complete, rigid motion offered by rowers with a pulling cord or chain. Needless to say, the grips on the handlebars are covered by rubber foam, to eliminate stress on the palms, and the formation of blisters. Finally, the rower’s footrests are made of durable PVC, featuring a pivoting design, allowing you to adopt the foot angle that feels best for you during workout. They feature heel guards and adjustable straps to secure feet in place. The resistance system of the Body Trac Stamina Glider 1050 is pretty simple. It involves one hydraulic cylinder, attached under the gliding rail, and connected to the arms. As you pull the handlebars and extend your legs, the cylinder extends, generating resistance. The machine’s resistance is constant. In other words, it doesn’t vary with how much strength you put behind each rowing motion, as in air or water rowing machines. But on the other hand, this rower offers 12 levels of resistance. There is an adjustment knob on the cylinder, which facilitates the adjustment. The first 3 levels offer a really light tension, great for users who must undergo a recovery training regimen. The top resistance levels on the other hand aren’t too extreme. Overall, this rower can offer light to medium workouts. One important aspect to cover here refers to the heating of the tension cylinder. As it heats up, the resistance will decrease a little bit, and you might feel the need to re-adjust. Therefore, it’s a good idea to start on a low setting, then after 5 minutes of rowing, to add more levels. The performance monitor, or the meter, is far from being a sophisticated unit. It’s actually one of the most basic models that you can find for this type of fitness equipment. It tracks time, calories, count and total count. Does not track distance, speed and pulse. It’s quite easy to operate though, featuring only one button. By pressing the button you can select what value should be displayed on screen at all time. Or, you can choose the SCAN function, which will cycle throughout all the values, displaying each one for 6 seconds, then moving to the next. It features only one button. In order to reset all the values to 0, except the Total Count, you need to press and hold down the button for 2 seconds. Total Count is reset only after the batteries are removed. 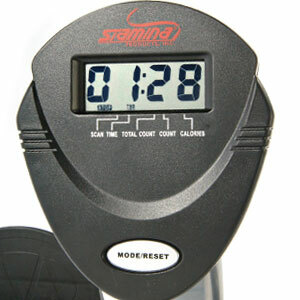 The fitness meter starts when it detects seat movement, and automatically shuts off after 4 minutes of inactivity. It uses two AA-type batteries, which are not included. The machine is easy to assemble. The tension cylinder and the arms are already connected to the main frame. Basically, you only need to attach the front and rear bases, footrests, seat, console arm and console, and of course, connect the movement sensor wire. A copy of the owner’s manual is included in the box, offering pretty clear assembly instructions. Also, the tools required for assembly are supplied. Maintenance doesn’t require much. Just as for any rowing machine, the seat rail needs to be cleaned periodically, as dirt fragments can cause nicks into it, leading to roller damage. Also, in case the joints of the machine become squeaky, lubrication can solve the problem. As you receive the product, you need to register it online (or via mail), in order to enact your warranty. Feet may slip off the footrests if not secured properly with the straps. 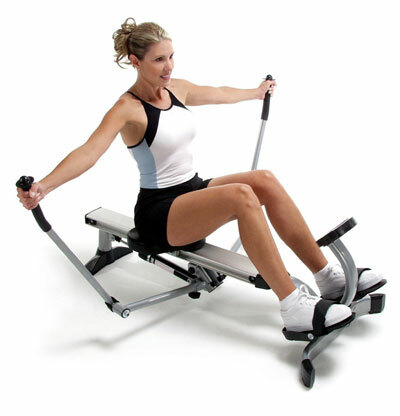 The Stamina Body Track Glider 1050 is a basic rowing machine, designed for light to medium training. It’s definitely not a machine for professional rowers, but on the other hand it’s a machine which can supply an excellent aerobic workout, being great for muscle toning, stamina building, recovery training and losing some weight. Like most rowing machines, it’s a great choice for elderly users as it eliminates an important part of the impact on the joints. It is a rowing machine made for home use, far from offering the quality, user capacity and functions of a Concept2 or WaterRower, but for its price, it offers excellent value.